When it comes to gorgeous views of nature, the Riversong Retreat has it all! 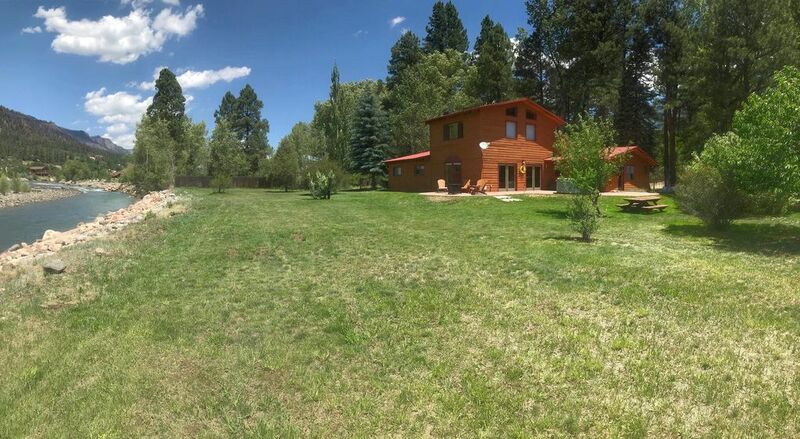 Situated right on the Animas River and surrounded by mountains, this spacious home is everything you want for your next Durango vacation. Conveniently located just 15 minutes from Durango and 20 minutes to Purgatory Ski Resort you can enjoy an array of activities close by. The living room has beautiful river and mountain views and a window seat just perfect for taking in the nature around you. Enjoy a meal next to the cozy wood fireplace in the dining area that seats 8. The kitchen is fully stocked with all you could need to cook for family and friends. Downstairs on the main floor are 3 bedrooms. The first has a queen bed and a private bath. The second has another queen bed and the third features 2 twin bunks that are perfect for the kids. These rooms share a full bath. Upstairs you will find the spacious master suite with king bed, tv in room, and private master bath. Curl up on the couch with a good book and watch the river flow by. The couch is a sleeper if you need additional sleeping options. The home also a features a detached game room/work out area with game table, foosball table, and weight equipment. After a long day of activities you can take a soak under the stars in the private hot tub on the back patio. There is a gas grill and plenty of outdoor seating, and this home is located on acreage so there is room to explore your surroundings. The Narrow Gauge Railroad runs right by the home and is a real treat for all to watch. Catch and release fishing is allowed in the river and the property boundary extends to both sides of the river. Two families of four stayed here for Spring Break and absolutely loved it! The rooms were great. The beds and bedding were comfy. The living space and dining was perfect for everyone to enjoy and spread out. We cooked breakfast and dinner every night. The kitchen and island space was nice for the little kids to sit and eat. The garbage disposal wasn’t that great so don’t put a bunch of stuff in it. The dryer took forever to dry so plan accordingly. Used the grill and hot tub and it was great on a cold snowy night. Location was right in the middle of town and the ski resort. Close access to the highway. After staying in other VRBOS in Breckenridge and Angel Fire, this is the nicest place we’ve stayed. We would definitely come back. The property was perfect for our family. The house is really clean and well appointed. We enjoyed being outside and grilling. We would definitely return! We loved our stay at this home. First, it was so clean! From the bedrooms and baths to the kitchen--absolutely clean. We had plenty of room for our 5 adults and 1 child. It is convenient to Durango and the beautiful area surrounding. The hot tub was ready to use and we enjoyed it. We had a couple of fires in the fireplace and it was so cozy and easy to use. The firewood was ready to go. We saw mule deer and some other wildlife that we don't see at home in the Midwest. The only reason I didn't give this home 5 stars is this--this was a birthday trip for my husband, an avid fly fisherman. After seeing the photos of the house, we thought it would be perfect with the Anamas River flowing past the house. We even called the property managers before renting to verify that it was a good spot to fish. They said yes. Imagine our disappointment when we looked at the rocky, nearly dry streambed. A dam has been built upstream to divert the water. I nearly cried. My husband soldiered on and found other places to fish, but I was disappointed. On a minor note, a grab bar would be a nice addition to the showers! We are so glad you enjoyed the home. I am not sure whom you spoke to in our office, but I do apologize they gave you misinformation about the river conditions. We manage quite a few riverside homes, so maybe they were confused on which you were referring to. There has not been a dam built, but this year was a drought year and we had a large wildfire earlier in the summer. Normally conditions are not like this. We do hope you will visit again next year when the river will be flowing again as it should. Beyond happy with our stay. Perfect location, the drive there was beautiful, the views were phenomenal, the decoration and set up of the home is perfect. Plenty of room, every detail was thought of prior to arrival which made the stay very stress free. Loved being able to sit out in the hot tub and take in the views of the mountains and river. We will most definitely be back! We were disappointed that the river was dry. I wish we would’ve been informed about the river, that’s partially why we chose this house. But we all did enjoy the scenery and the kids enjoyed exploring - even the dry rocky riverbed! The house is great, very well stocked. Cozy and comfortable. Nicely decorated! It’s in a fantastic location, just outside of town but not far. The neighborhood/area is so nice and quiet. There’s so much to do in Durango and the surrounding areas. The drive to Silverton and Ouray is absolutely gorgeous and not far. We enjoyed stopping along the way there and back to explore back roads off 550 and some of the lakes between here and there. Mesa Verde is a great day adventure as well. We definitely recommend Riversong Retreat and Durango! We are so glad you enjoyed the home. The river is only temporarily dry right now due to the wildfire we had in June. Normally it is not like this. It should be back to normal soon and we hope you can come visit us again when it is flowing as it should. Beautiful property in perfect location!! We stayed a week with our entire family and had an absolutely wonderful time. The house is gorgeous and well appointed with everything you might need. Having the washer/dryer is a must after rafting and off roading :) We would definitely recommend this home ... only wish it hadn't been during a dry season as the river wasn't running. I'm sure that would make it absolutely perfect!! !